The Democratic Town Committee will hold its September meeting on Thursday, September 15th at 7 p.m. at the Pulaski Democratic Club, 89 Grove Street. All Democrats and friends are invited to attend the meeting that will occur just 53 days from Election Day. DTC Chair Bill Shortell will formally appoint four committees including voter registration, media, outreach and rules. The agenda will also include an update on the fall campaign and discussion of several municipal issues: city charter referendum questions to appear on the November 8th ballot, the sale of the Patton Brook well and the proposed Tilcon project on watershed land. Committee members are expected to raise concerns about the city School Building Committee’s decision to select a troubled Bridgeport firm as the architect for the Smalley Academy renovation project. DTC members and friends are invited to the first New Britain Democrats’ Casino Night on Saturday September 24th to benefit voter registration and get out the vote activities. Tickets are $40 per person. Mohegan Sun will be the venue for attendees who will receive a complimentary $30 for food and free bets. Round trip bus transportation to Uncasville will be provided with departure scheduled for 2 p.m. on September 24th. Tickets and information are available from DTC members John McNamara and Tom Shields. To make a reservation e-mail newbritaindemocrat@gmail.com or call 860-827-9469. Casino Night Is a Democratic Town Committee event. To make a contribution to the Town Committee download the fillable Contribution Form. State Party Will Recognize Rep. DeLauro, Others At Women’s Leadership Brunch, Sunday, September 25th. 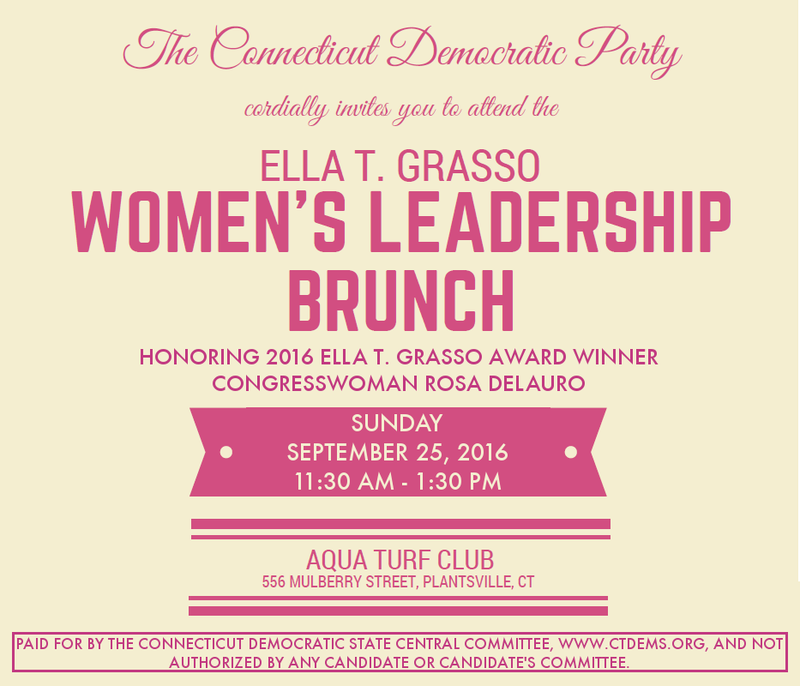 The CT Democratic Party will recognize Democratic women for their leadership in politics and public service at the Ella T. Grasso Women’s Leadership Brunch (formerly breakfast) to be held Sunday September 25th from 11:30 am to 1:30 pm. The event will be held at the Aqua Turf Club, 556 Mulberry Street in Plantsville. U.S. Rep. Rosa DeLauro (D-3) is this year’s recipient of the Ella T. Grasso Award. Emma Pierce, DTC member and former state party treasurer, was the first recipient of the award that was established at the women’s breakfast. Alderwoman and DTC Vice Chair Shirley Black and Realtor Harriet Geragosian have also been recognized by the state party with leadership awards in prior years. Guest speaker for the event is Ellen Malcolm, a founder of Emily’s List. Emily’s List is a national political action committee supportive of women candidates and issues. 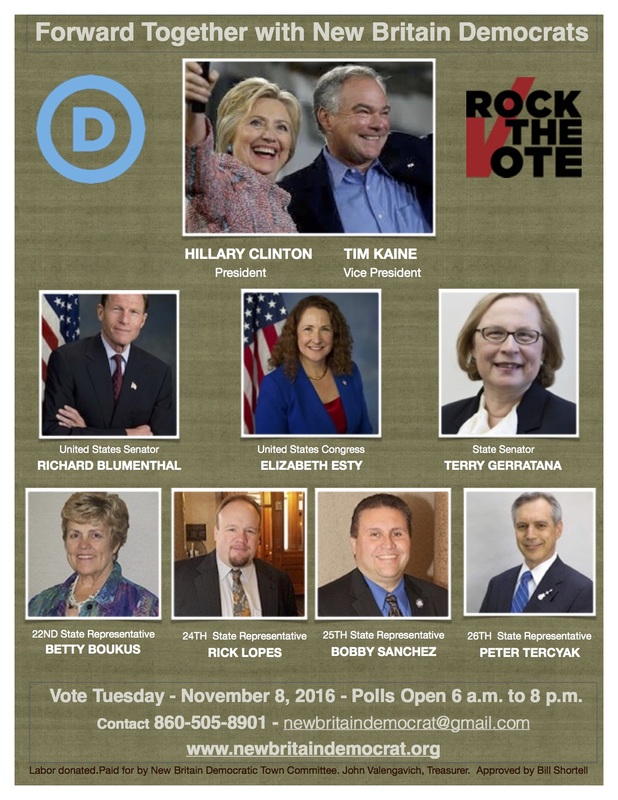 Admission for the brunch benefitting the CT Democratic Party is $65. For information contact the Democratic State Central Committee or visit women’s leadership brunch. This entry was posted in Election Day, Fundraiser, Meeting/Event, Weekend Update, Women's Issues. Bookmark the permalink.